(Stockholm, Sweden, December 14, 2017) – Autoliv, Inc. (NYSE: ALV and SSE: ALIVsdb), the worldwide leader in automotive safety systems, has received a prestigious innovation award from FCA for its work with FCA’s visionary project on future urban car safety. Autoliv received the award together with Zenuity, its system software joint venture. “We are incredibly proud to receive this award. It proves that Autoliv’s vision of Saving More Lives and Zenuity’s of Make it Real means so much more than words. In a short timespan we have provided products, solutions and expertize that have made it possible for FCA to go from concept to demo of its vision of future urban car safety”, said Johan Löfvenholm, President, Autoliv Electronics. “In the end this is what matters – delivering real solutions to real customers that enables them to realize their visions,” he continued. 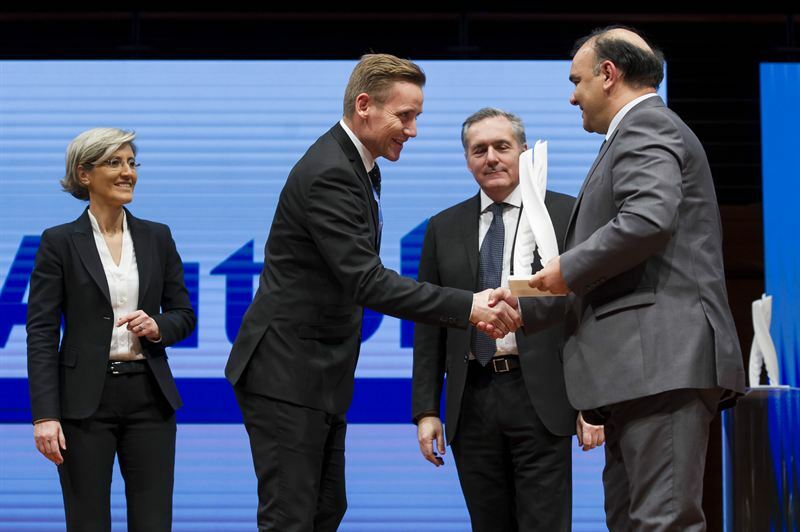 Autoliv and Zenuity received the award for their implementation of active safety hardware and software that enabled a number of advanced active safety and ADAS features in a small form factor vehicle, hence making it supremely safe in urban environments. Today 50% of all accidents occurs in urban traffic, and with the on-going urbanization this number is expected to continue to grow. Reducing urban accidents is one of the prime focus areas for traffic authorities, OEM’s and safety suppliers around the world. This report contains statements that are not historical facts but rather forward-looking statements within the meaning of the Private Securities Litigation Reform Act of 1995. Such forward-looking statements include those that address activities, events or developments that Autoliv, Inc. or its management believes or anticipates may occur in the future. All forward-looking statements are based upon our current expectations, various assumptions and data available from third parties. Our expectations and assumptions are expressed in good faith and we believe there is a reasonable basis for them. However, there can be no assurance that such forward-looking statements will materialize or prove to be correct as forward-looking statements are inherently subject to known and unknown risks, uncertainties and other factors which may cause actual future results, performance or achievements to differ materially from the future results, performance or achievements expressed in or implied by such forward-looking statements. Numerous risks, uncertainties and other factors may cause actual results to differ materially from those set out in the forward-looking statements. For any forward-looking statements contained in this or any other document, we claim the protection of the safe harbor for forward-looking statements contained in the Private Securities Litigation Reform Act of 1995, and we assume no obligation to update publicly or revise any such statements in light of new information or future events, except as required by law.